Given that Kachin societal relationships are governed by kinship ties, what is your family connection to the late Kachin Independence Organization (KIO) Chairman? My mother and the late Chairman were first cousins, her mother and his father being siblings. I spent my first three years of schooling at the Kachin Baptist High School at Myitkyina, where the Chairman was headmaster. He often came by to our house as it was quite close to the school. When Chairman Brang Seng came to Germany on the first leg of his European trip in 1987, you were living in Bonn, West Germany. How did he make contact with you? Early one morning at 2 am in October 1987, my phone rang. Picking it up, I was astonished to hear the voice on the other end say “This is your uncle Brang Seng.” He was calling from Bangkok to tell me he was coming to Germany. He was accompanied on the trip by the current KIO Chairman Lanyaw Zawng Hra (who was then Secretary General), James Lum Dau, the KIO Representative in Bangkok at that time, and Jessie Gam Seng who acted as translator. It was quite audacious of Chairman Brang Seng, the leader of an outlawed ethnic armed group, to venture on an international trip. What was the purpose of the trip? How was this managed, do you know? The Chairman likened the Kachin conflict to a football match without a referee, where there can be no clear winner, only an increase in the suffering of innocent civilians. He was convinced that international mediation was essential to resolve the conflict. With the mission of drawing international attention to the Kachin struggle, the Chairman and his deputy Zawng Hra, embarked on a 6-month long trek from the KIO Headquarters of Pa Jau, on the Chinese border, to Thailand. Along the way, they met with other ethnic armed groups, and once in Bangkok, made the necessary contacts and arrangements for their international travel. The itinerary included visiting regional neighbors before making the European trip. The German visit was prompted by Mr. Jurgen Hoffmann’s invitation, extended through the Chairman’s wife whom he met during a trip to China, and the Chairman recollecting that I was in Germany. What was your role in helping him put his message across in Germany? When they arrived, I put the KIO team in contact with friends at the Foreign Office, Ralph Hermesdorff and his wife Maria Hamerlak-Hermesdorff. Impressed by the Chairman’s sincerity, they arranged for him to meet with influential Germans like Mrs. Brigitte Erler (Secretary General of Amnesty International Germany), Dr. Michael Baumann from the Federal Ministry for Economic Cooperation and Development, retired Ambassador Dr. Pier Fisher, among others. Mr Hermesdorff also arranged a Justice and Peace roundtable conference which gave the Chairman opportunity to talk about the humanitarian crisis in war torn Kachin State. Without the understanding and compassion of these friends, the KIO trip would not have been such a success. 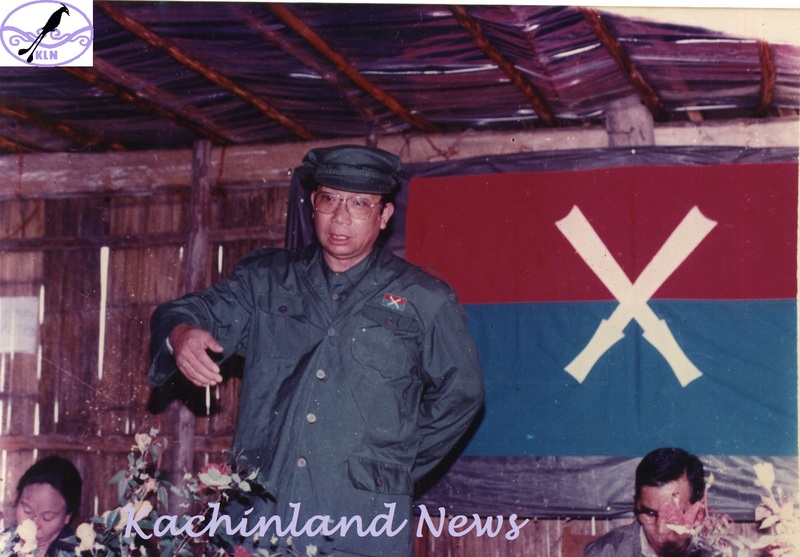 The Chairman’s message – the same as the KIO stand today – was that the Kachin conflict is political in nature, and must be resolved at the negotiation table. He stated this position strongly and consistently at all the meetings. What in your opinion, are some of the positive outcomes of the Chairman’s European trip? For the first time in its 20-year existence, the KIO received international attention as an ethnic revolutionary group seeking to resolve decades of civil war through political dialogue. A direct result of the round table conference was that for the first time ever, Kachin war refugees received humanitarian assistance when the Women’s World Day of Prayer-Germany earmarked its 1988 offerings for Burma. Another tangible result was the Friedrich Naumann Foundation for Freedom’s sponsorship for the Constitution Study Group of the Democratic Alliance of Burma[i], to attend workshops in Germany and Thailand in 1990. The Chairman considered the opportunity to meet with expatriate Burmese groups during his visit a valuable outcome. He was always very happy to meet with people from Burma and was full of praise for the Berlin Burmese group that came to meet him, upon learning of his presence in the city. From Germany, the KIO team went on to London, where they had another fruitful visit due to the kind assistance of Martin Smith, a British journalist and writer of books on Burmese and ethnic minority affairs. You have credited the KIO Chairman with directing you on the path of humanitarian work. How did that come about? After taking up the Chairman’s challenge and seeing for myself the desperate humanitarian situation in the border areas, I decided to involve myself in relief work for people affected by armed conflict. In 1990, I left Germany and moved to Bangkok to immerse myself full time in humanitarian work. In 1997, in consultation with ceasefire groups, faith based groups and existing Myanmar NGOs, and the help of peace negotiators and other friends, I was able to establish the Metta Development Foundation. The aim of the Foundation was to help communities rebuild after the ceasefire agreement of 1994, as a way of complement the peace process. I believe that unless the root causes of armed conflict are resolved, humanitarian crises will keep occurring. Chairman Brang Seng has been described as a shrewd politician and a visionary leader. Any comments on this observation? His groundbreaking 1987 international trip was a bold move which allowed him to articulate the political nature of the Kachin struggle to a worldwide audience. Going against the grain of popular opinion of the time, he was against international sanctions. His view was that isolation does not work, and that a better way would be to provide development assistance in keeping with the situation on the ground. How would you characterize his leadership style? During Chairman Brang Seng’s time, as is the practice today, every major decision within the KIO was made through consensus. It was never a one man show. Having said that, the fact remains that he was a charismatic figure and was able to sway opinion to go his way. He was someone who firmly believed in dialogue and engagement. I believe his headmaster experience put him in good stead in reaching out to others. He was one leader not addicted to maintaining the status quo. What do you think are some of Chairman Brang Seng’s most innovative contributions, in terms of strengthening the KIO organizationally? It was during his time that the separation of the military and political wings was effected, with the political wing given dominance over the military. Although the KIO suffered a military setback in 1987, having to let go of its Pa Jau headquarters, it scored a major political coup in that the KIO received the international recognition it sought through the Chairman’s international foray. The level of access the Chairman received in neighboring China, India and Thailand, was something not accorded any other ethnic leader. Some detractors of the 1994 ceasefire agreement are of the opinion that the Chairman was too eager to negotiate peace, that he was blindsided by the government and peace negotiators. How much traction would you give this statement? I can only say that he seized upon the promise of a national convention whereby ethnic armed groups and political parties of all stripes and ethnicity can come together to dialogue with the government and army and hammer out a process that would bring peace and stability to the country. He decided to give peace a chance but the fact is that the national convention did not turn out as he had envisioned. In light of your close relationship with Chairman Brang Seng as mentor and family elder, do you have anything more to add regarding his personal characteristics? He taught me by example to always show respect for others regardless of age, social standing or ethnicity. He never used his position to impose authority or instill fear in others. His compassion and desire to help the down trodden were qualities that drew me and others to the Kachin cause. He believed that all ethnic groups, including the majority Bama, must learn to coexist and work together towards the common goal of making our country a peaceful, developed nation. One other important lesson he taught me was not to be hasty in passing judgment, to take time to listen to other points of view, and not dismiss them off hand. The Chairman’s positive outlook was something I found quite remarkable. His reaction to the media no-show at a KIO press conference in Rome, during his second European trip in 1988, was typical. It so happened that PLO leader Yasser Arafat was in town, arriving on the heels of the declaration of the Palestinian statehood, and naturally all attention was on him. Instead of being discouraged, the Chairman said he was happy about the Arafat media frenzy as it gave him hope that one day the Kachin struggle would likewise receive due attention when the world came to know more about its political goals. If you were to write an epitaph on his tombstone, what would you say? A man of great Metta or Loving-Kindness. [i] Chairman Brang Seng was Vice Chairman of the Democratic Alliance of Burma (DAB), established in late 1988 that brought together over 30 groups of armed ethnic minorities and Burmese students and exiles. [ii] Maran Brang Seng: In His Own Words. Interview by Martin Smith and Larry Jagan; Burma Debate: Vol 1, No. 3 (December 1994/January 1995); a publication of the Burma Project of the Open Society Institute.